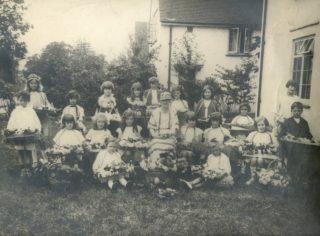 We think that this fantastic photograph of a group of children carrying trays full of flowers, was taken outside 70 Handside Lane in the 1920’s. The children were pupils of the Alpha School, and they are seen here seated alongside Mrs Edith Haggis, their teacher. Alexandra Rose day was set up in 1912 to celebrate the 50th anniversary of the arrival of Queen Alexandra, the Consort to King Edward VII, from her native Denmark to England. Her arrival in England in 1863 was a lavish occasion with The City of London spending £40,000 on decorations and illuminations alone. It was also the first royal event to make use of the new processes of photography, which made it possible for photographs of the Princess to be sold in shops prior to her arrival. On the 50th anniversary of her arrival in England, The Dowager Queen’s admirers wanted to host a similar spectacle, but the Queen wanted to mark the occasion in some other way. She decided that instead of a procession, artificial wild roses would be sold in London to raise funds for the sick and needy. The day was to be called ‘Alexandra Rose Day’, with the first event raising £32,000 for London hospitals. By 1920, £775,000 had been raised for charity. Queen Alexandra’s last Rose Day was in 1923. She died two years later in 1925. It would be lovely to think that someone remembers one of the children in the photograph. If you have any memories of Handside or Alexandra Rose Day, please do comment below! This page was added on 30/06/2009.